We firmly believe in the training, which in fact turns out to be one of the fundamental points of our company policy, considering it to be one of the tools for success and the competitiveness of its customers in the market. We interpret the formation as a carrier of knowledge between our company, our customers and the main companies consolidated in the sector of decorative paints. EdilParatiAcilia with considerable investment is proud to have created a structure of their own training center, which is equipped and organized according to the most modern methods and strategies for training. 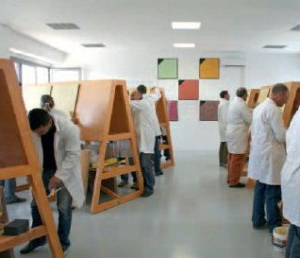 The training courses totally free kept by the technical staff of our colorificio offer to applicators and private ,a real reference point for their professional growth, while meetings with our suppliers, provide a valuable comparison of the cognitive and the in-depth between industry experts. Inside of the same structure, are also scheduled sessions and demonstrations in order to keep updated the applicators professional of the continuous evolution of technology and of the materials used.